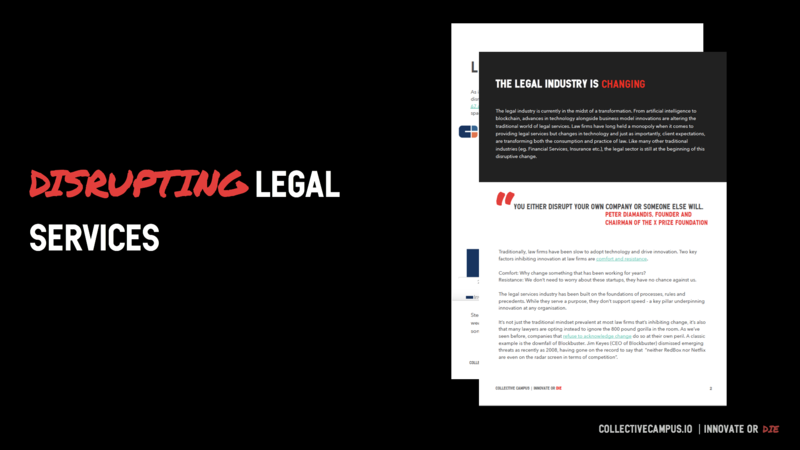 The legal industry is currently in the midst of a transformation. From artificial intelligence to blockchain, advances in technology alongside business model innovations are altering the traditional world of legal services. Law firms have long held a monopoly when it comes to providing legal services but changes in technology and just as importantly, client expectations, are transforming both the consumption and practice of law. It’s not just the traditional mindset prevalent at most law firms that’s inhibiting change, it’s also that many lawyers are opting instead to ignore the 800 pound gorilla in the room. As we’ve seen before, companies that refuse to acknowledge change do so at their own peril. A classic example is the downfall of Blockbuster. Jim Keyes (CEO of Blockbuster) dismissed emerging threats as recently as 2008, having gone on the record to say that “neither RedBox nor Netflix are even on the radar screen in terms of competition”. This eBook provides insight into how the legal industry is changing, the impact of technology and how law firms can innovate in order to succeed and stay relevant.